Does the Owner’s Manual Cover How Often the Air Filter Should be Replaced? Manufacturer recommendations on when to change your engine air filter can vary greatly – from 12,000 to 45,000 miles. You’ll want to check your vehicle’s owner manual to be sure. While your manufacturer will have a recommended time frame for air filter replacement, if it’s dirty, don’t wait. Different driving conditions can accelerate the need for air filter replacement. 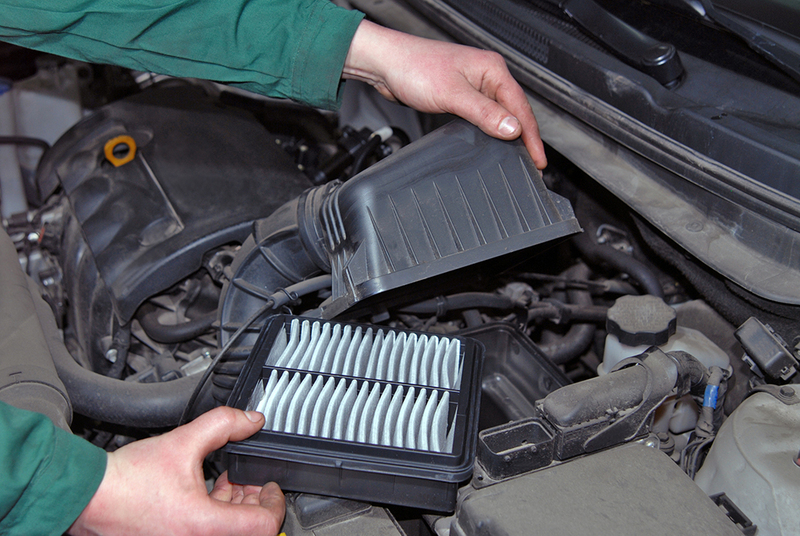 Dusty conditions, off-road driving, or desert-like environments can clog filters more quickly. Regular driving in urban environments or heavy traffic can also reduce the life of your automotive air filters. You should check your air filter at every oil change or at least twice a year. A dirty filter can allow accumulated dust, dirt, and contaminants to get into your engine, which can inhibit its operation. In extreme cases of neglect, it can even degrade and flake off pieces of the filter into the engine. A dirty filter can dramatically reduce your vehicle’s acceleration by as much as 11%, according to a Department of Energy study. In older vehicles with carbureted engines, dirty air filters could also negatively impact gas mileage. That’s no longer the concern, however, in any vehicles newer than the 1990-1991 models when the last vehicles with carbureted engine were sold. While paper filters are the most common and work in most situations, you may consider oiled filters, which trap more contaminants. The oil absorbs additional dirt that may not be trapped by the micron mesh. Oiled filters are more expensive, but have a substantially longer life, up to 50,000 miles between service. It can also be cleaned, recharged, and reused. If you’re driving in extremely dusty locations, you may want to think about adding a pre-charger. A pre-charger is a polyester “bonnet” that fits over the air filter. By wrapping the air filter, you get an additional layer of filtration without reducing engine air flow. Pre-chargers will need to be cleaned and oiled approximately every 5,000 miles to keep optimal performance. You want to look for air filters that can deliver optimal dirt holding capacity and filtering efficiency to provide the maximum protection for your engine. Make sure the filter you choose meets or exceeds OEM standards with at least 99% efficiency. In addition, air filters should provide a minimum of 12,000 miles of engine protection from dust and harmful particles with low pressure drop to maintain optimal air flow. Each vehicle needs a specific air filter. You can use the handy Premium Guard Air Filter Lookup to find the exact match for your vehicle.